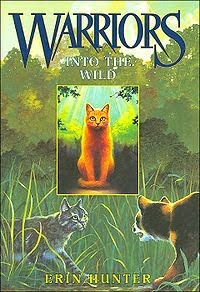 Warriors by Erin Hunter, is a series about cats. Yes cats. But not just any cats, special cats. These cats live in the forest and have four clans called, Thunder Clan, Wind Clan, River Clan, and Shadow Clan. Now there is a fifth called Star Clan that contains cats that have died. Now that you know the way of the Warriors, let's begin our tale. This tale starts with a cat named Rusty. He is a pet cat that has strange dreams about being in the forest and living the wild life as they say. One day when Rusty escapes from the forest, a Thunder Clan cat finds him and brings him to Bluestar, the leader of the Clan. She gives him the name Firepaw and allows him to be part of the Clan.But Thunder Clan is in grave danger, and Shadow Clan is growing stronger, Bluestar asks for a prophecy. When Bluestar gets the prohecy that states: Fire alone can save the Clan, it can only mean Firepaw. Firepaw may just be the strongest warrior of them all and the one who can save them from falling to their knees. The first time I picked this book up was in third grade when one of my friends suggested it to me. It started out rough at first but then I started getting into the groove of the book then Bam!!! I read the entire series in a month. If you have a younger brother or sister or is in second or third grade, start this series and see how it goes. I hope you enjoy it.